What Should Be Done if Dilatations with Adjuncts Fail? Conservative management is still preferable to esophageal replacement after failure of dilatation with adjuncts. There is no consensus about the definition of a refractory stricture or recurrent stricture. Before classifying a stricture as “refractory” it is important to assure that it was properly treated. Endoscopic electrocautery incisional therapy (EIT) and esophageal stenting may be successful. 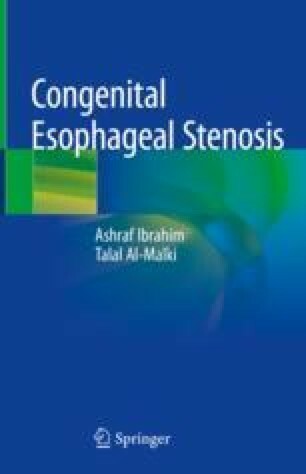 Removable covered stents allowed its use in children and expanded the indications for its usage to include a wide variety of congenital and acquired esophageal strictures. Contrary to other stents where food passes within the stent, the food in the customized dynamic stent passes between the stent and the esophageal wall allowing long term improvement of esophageal patency. The dynamic stents improve esophageal motility unlike the widespread self-expandable plastic or metallic esophageal stents. Stents are very effective for treating post-dilatation perforations and post-anastomotic leaks. Gagging, stent displacement, migration into the stomach, perforation, air way compression, granulation tissue, GERD, aspiration pneumonia, and arterioesophageal fistula are possible complications of stents.